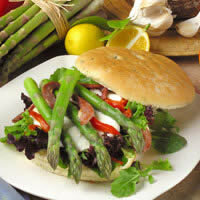 Pancetta, mozzarella and aioli prove a scrumptious combination in this quick and easy sandwich. Make sure all ingredients are at room temperature before proceeding. To make Lemon Aioli, whisk together lemon zest, lemon juice, garlic and salt; whisk in mayonnaise and oil. Spread smooth side of each focaccia square with 1/2 tablespoon aioli. Divide remaining ingredients among 4 squares focaccia, layered in the order listed. Top with remaining foccacia squares. Cut each sandwich in half into 2 triangles. Sandwiches can be served at room temperature or warmed for a few minutes in the oven at 450° F. Sandwiches should not be hot.